This Caesar Salad is a family favorite! The added kale adds extra nutrients and color, but no one will taste the difference! Topping with shrimp is my sister's favorite way to eat Caesar Salad, but we sometimes put on thin slices of grass-fed steak to make it a satisfying meal. Place the garlic into the food processor and process until finely chopped. Combine the rest of the ingredients EXCEPT the olive oil and process. Then, one drop at a time at first, add the olive oil while the food processor is running, to emulsify. This will make quite a bit of dressing. Store in the refrigerator. To make the salad, wash and tear romaine lettuce hearts into bite-sized pieces. Take the stems off of the kale and tear into small bite-sized pieces. About a third of the leaves should be kale. Place leaves into a large bowl, add the dressing a little bit at a time, tossing to coat well. Taste the leaves often to make sure they are coated but not over-dressed. A little goes a long way! 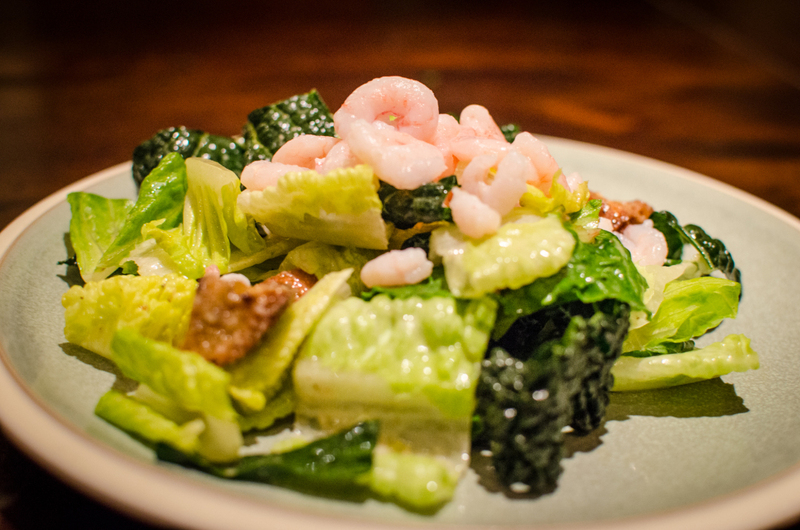 Mound the salad on a plate and top with baby shrimp.